Clusters of stark white berries dangle from leafy stems in the forested understory. Snowberry (Symphoricarpos albus) is perfectly named for its color. This pretty bush is in the same family as honeysuckle, and is native to Canada and much of the US (except for the southernmost states). Some sources say that the berries are NOT edible, with symptoms listed as vomiting, dizziness and mild sedation in children. However, west coast tribes ate the fruit both fresh and dry (though they apparently didn’t prefer it). It was also used as a shampoo, a poultice, and a treatment for STDs. The wood was used as arrow shafts and pipe stems. 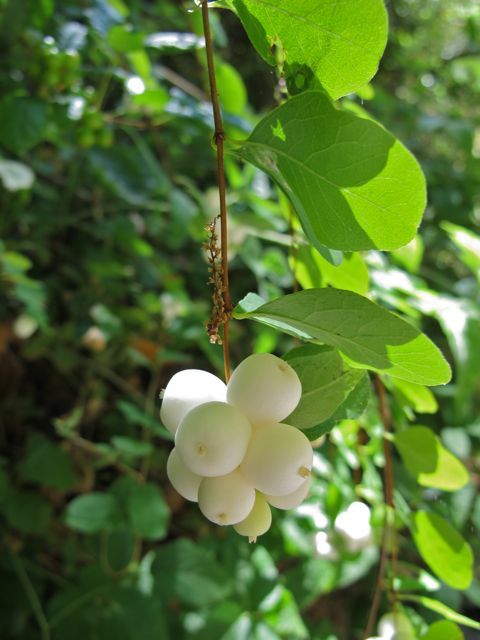 There are two species of snowberry in Marin, and several others are found throughout California. 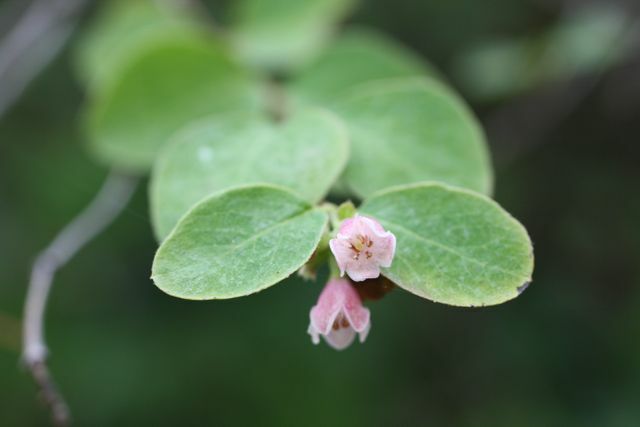 In Marin, you can tell common snowberry from its cousin, creeping snowberry, because it is taller and doesn’t have hairs on the top of its leaves. So you thought a blackberry was always a blackberry, huh? Well, no. Or rather, there are a few different kinds of blackberry, so you have to look close. 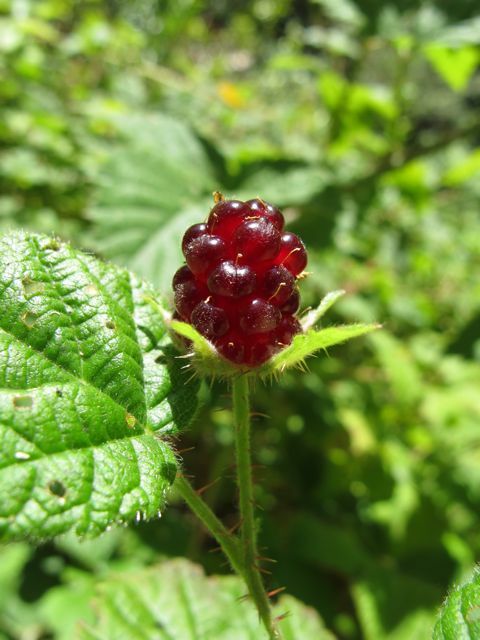 I wrote about the invasive Himalayan blackberry a few weeks ago–but now the native Pacific blackberries (Rubus ursinus) are beginning to ripen, so keep your eyes out for them as well. Superficially, these look similar to their invasive cousins. Both grow in prickly mounds of briars. Both have leaves that generally are in groups of three, and many-segmented berries. But Pacific blackberries are all-around more delicate: their berries and their thorns are both more delicate, and their leaves are a lighter green and a thinner texture. Flip one over, and the Pacific’s leaf will be green below while the Himalayan’s leaf will be white. If you get a look at the flowers, the distinction gets even easier. 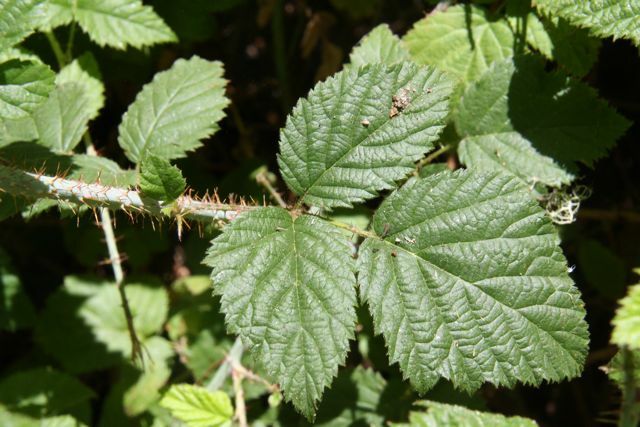 Pacific blackberry is the only local member of the Rubus genus to have gender-segregated flowers. What this means is that instead of male stamens and female pistils being in the same bloom, some flowers only pack pistils while others only sport stamens. And that is why botany is awesome. 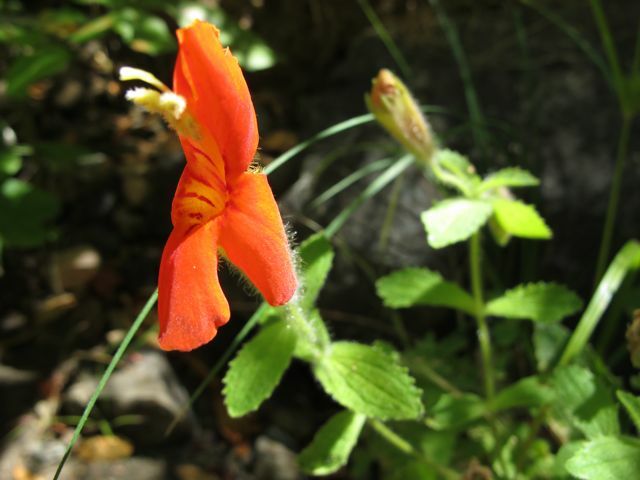 Orange-red flowers grow in the dappled shade of a dry stream bed. This is the scarlet monkey flower, or Mimulus cardinalis–one of the most lovely of this group. With bright green leaves and flashy flowers it is a treat in gardens and wild places alike. Hummingbirds, butterflies and other insects also love this plant, but deer do not. Native plant gardeners rave about the monkey flowers in general for this reason. Scarlet monkey flower is usually found near water, and so when you see it you have a strong clue that you’re in a wetland or near a stream (and below 8,000 feet, which is the upper limit of its range). 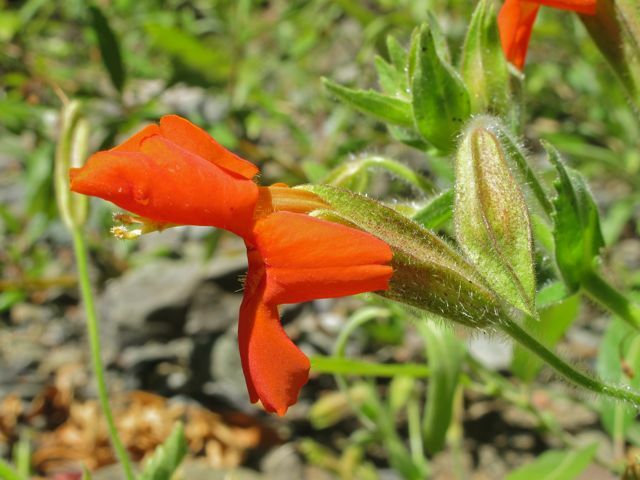 You can see them growing in most parts of California from the northern Sierra to San Diego. Outside of the state, it grows north into Washington state and east as far as New Mexico. If you learn only one plant as a Californian, it should probably be this one. Our state flower is simply stunning. Rich orange flowers bloom lushly atop feathery foliage. The cup-shaped blossoms were originally pollinated by beetles, but they have also become a favorite of the introduced European honeybee. California poppy (Eschscholzia californica) is one of the most beautiful flowers of the spring, and it blooms well into the summer with good showings still going on. In this area they usually grow in scattered patches, but in places you will see them blanketing hillsides or valleys in a carpet of orange (eg Santa Barbara’s Figueroa Mountain). In harsh places the flowers can be on the small side, but in good conditions each of the four petals can be over two inches long. This poppy is native to the west coast of North America, but because it is a beautiful and hardy garden flower it has been introduced to many other parts of the country and the world. Native Americans are said to have used the pollen as a cosmetic. They also ate the leaves, and used the plant as a mild pain-killer to treat insomnia and toothache. Extract of poppy is still sold today, and was touted as an alternative to Oxycodone by television personality Dr. Oz. Pink, poppy-sized flowers show up with a flamboyant burst of color on the browning hillsides. Each of the four delicate petals are dotted with a dark red splotch. This is farewell to spring, or Clarkia amoena. There are several species of Clarkia in Marin that differ slightly from one another; this species can be either white or pink. You can distinguish it from the other similar species because it has red splotches instead of a red ring on the petals, and the buds don’t droop. These flowers seem to thrive on dry road cuts – I’ve seen them growing along Highway One in several different places (these photos were taken just south of Tomales). One of the most common thistles around is bull thistle, an invasive species from Europe. Its showy purple flowers are beloved by bumble bees and other insects, but its spiny leaves are a bane to ranchers. Bull thistle (Cirsium vulgare) grows most abundantly in coastal grasslands, along the edge of marshes, and in sunny openings in forests, according to the California Invasive Plant Council – but it is found in every state in the country. You can recognize this species because the leaves don’t stop when they meet the stem; instead they run down along it like little spiny wings. This plant thrives on disturbance; it grows most readily when the soil is disrupted by plowing, logging, digging and so on. Even gopher activity can give it a boost! In low wet places, a mat of green leaves and yellow flowers grows. The flowers have five glossy, spreading petals and many stamens. Pale green splotches dot the leaves, which are three-parted and ragged at their ends. This is creeping buttercup, or Ranunculus repens. It’s a mildly invasive plant that is becoming common along trails and roadsides where it can form large patches. Its stem can sprout roots where it touches the ground, enabling it to spread easily. This flower is a relative of the taller, leggy California buttercup (a native). On an open hillside is a graceful thistle with whitish stems and leaves. Look close and you’ll see a cobweb-like webbing stretched between the spines. This is cobweb thistle (Cirsium occidentale), one of the most beautiful of the native thistles. A busy community of bees, ants and other insects also find it attractive! You’ll see them buzzing and crawling around the plant and (apparently) sometimes dozing in the flowers. There are a LOT of thistles in the area; CalFlora lists eighteen different species, most of which are invasive. But unlike these non-native species, cobweb thistle tends to grow singly or in sparse groups. And plus, it’s cobwebby. There are other native species with this feature (the technical term for cobwebby is “arachnoid”) but they have leaves right beneath the flower head, and a very different growth form. As I walk down the marshy trail there is a strong minty smell in the air. This is coming from small purple-flowered plants: pennyroyal, or Mentha pulegium is in the mint family and almost always grows in wetlands. Even if the ground appears dry, it’s a strong indicator that a low summer-dried fields or valleys was wet in the spring, according to the Flora of Marin. Pennyroyal is another weedy non-native species native to Ireland and other parts of Europe. There are a lot of other members of the mint family that have tuft-like purple flowers, but pennyroyal is the only one in the area that has discrete whorls of leafless (or small-leaved) flowers in stacks along the stem. It tastes great in salads, but fennel (Foeniculum vulgare) is an unfortunate weed in California. It grows avidly along roadsides and in other disturbed places. This plant grows up to ten feet tall, with feathery leaves and yellow umbrella-shaped umbels of flowers. The leaves and the seeds have a distinctive licorice flavor, which is likely why the plant came to the Americas in the first place. It’s been used as a spice and a medicinal plant for centuries, and is thought to have escaped into the wild time after time. Fennel is an invasive species, and takes over areas by forming dense stands where nothing else can grow. This isn’t just because the plants are so numerous that there is no room for any others. They also exude chemicals that actually prevent their competitors from growing!